*To receive a prompt response please send your enquiry via email as our leasing mobile is not always attended to. * *THIS IS STUDENT ACCOMMODATION ONLY. *STRICTLY 1 PERSON PER ROOM (NO COUPLES) *PRICE IS PER ROOM * *ALL BILLS INCLUDED! About This House: Fresh &amp; bright, large Queenslander home with high ceilings and timber polished floors throughout. 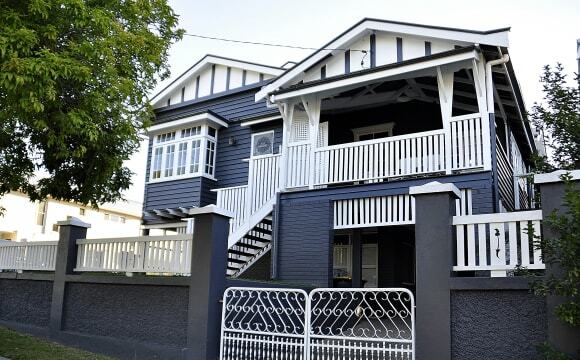 Situated in a quiet street yet still in the heart of East Brisbane. This house has multiple outdoor areas including a POOL! Enjoy your student life in a house where you can study in peace and then relax by the pool! This beautiful home has only 3 bedrooms! This means you only have to share with 2 others! 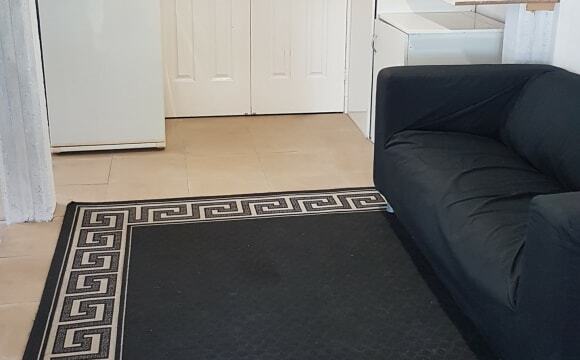 Available Rooms: Room 1 - $230.00 pw Room Type: Ensuite - Leased Room 2 - $180.00 pw Room Type: Large - Leased Room 3 - $180.00 pw Room Type: Standard - Available Now What Does The Rent Include: Water, Electricity, Gas Furniture, Internet, Lawn Maintenance What's Inside The Rooms: Room 1 - Double Bed &amp; Mattress, Curtains, Built In Wardrobe, Ceiling Fan, Desk, Chair, Ensuite Room 2 - Double Bed &amp; Mattress, Curtains, Built In Wardrobe, Ceiling Fan, Desk, Chair Room 3 - Double Bed &amp; Mattress, Curtains, Built In Wardrobe, Ceiling Fan, Desk, Chair What Are The Communal Areas Like: Fully furnished with quality furniture throughout Fully equipped kitchen Modern, Safe &amp; Clean High ceilings throughout Fresh, bright &amp; airy Air-conditioned in living room Outdoor Deck In-ground Pool Beautiful main bathroom with huge bath tup What Public Transport Is Close To This House: 150m Heidelberg St Bus Stop 14 (catch bus 230 to Bulimba, Gabba, South Brisbane, City, Valley) How Close To This House Are Education Facilities: 2.5km to Shafston Institute of Technology 3.8km to Griffith University Photography South Brisbane Campus 3.8km to QUT Gardens Point Campus 4.8km to James Cook University 9.9km to UQ St Lucia Campus over the Eleanor Schonell Bridge 7.5km to QUT Kelvin Grove Campus 11.2km to Griffith University Mount Gravatt Campus 11.2km to Griffith University Nathan Campus What Shops Are Close To This House: 800m to SPAR Supermarket &amp; convenience store, Bakery &amp; Post Office 1.4km to Coles Woolloongabba. This is a fabulous old QLDer (recently renovated) in an awesome spot. Really close to city cat and buses, shops etc. Quiet green street. Lock up garage downstairs with space for another car and storage space. All rooms have air con, 2 bathrooms so you will have your own bathroom. It has a great back deck for BBQs. The house is furnished. I can provide you with a bed if you need it, otherwise bring furniture for your room. Heaps of storage space under the house. The house also comes with an entertaining cat! I've lived here for a year now and love the house and the location. come join me! 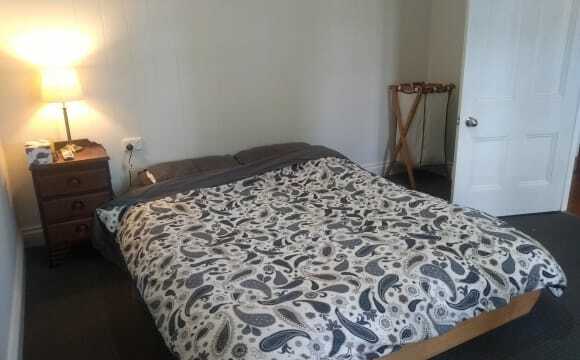 ALL UTILITIES PAID BY OWNER 1 Student room available. Please be there for the start of the inspection. 2 Very large flats self contained on each level. 5 Bedrooms each flat. 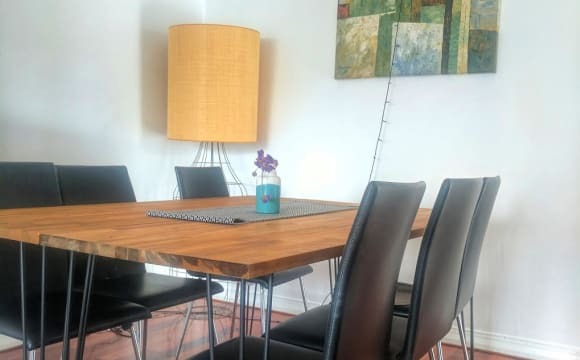 1 STUDENT room $165 per Week. Very good property. * Character features through-out * 2 Modern, large kitchens. * 2 Large spacious decks. 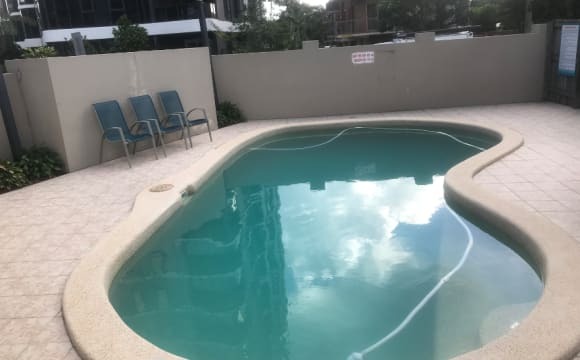 * Completely private and furnished VERY CONVENIENT LOCATION * QUT Gardens Point, UQ Brisbane easily accessible as is, South Bank and its education facilities * Close to restaurants and cafes *The CBD itself approx 2KM away * Shopping close by * Very short walk to Buses and Ferry. **INSPECTION NOTES: Please register your details with our office if you'd like to inspect this property. Our inspection times may change without notice unless you have registered your interest. The rooms will be available on 1/ May/2019 -	All Bedrooms with wardrobes, -	Modern Kitchen including all that is needed to prepare gourmet meals. -	European stainless steel appliances including oven, microwave and dishwasher.. -	Internal laundry including washing machine. This renovated Apartment is located in an outstanding location near excellent public transport, just 4km from the CBD. Coles Supermarkets, Cafes and Restaurants are within walking distance. Hey mates! I have a fully furnished single room in my house available to move in soon! 534 Vulture St - East Brisbane The weekly rent is $165.00 with unlimited internet included. Another bills are not included! - Great location (close to Coles, Shafston College, bus stop, Dan Murphy’s, behind the Gabba) ✅ - Smart TV ✅ - Home theatre ✅ - Netflix ✅ - Friendly Flatmates ✅ - Garage ✅ - Balcony✅ Summarizing is just enter and live without problems !! If you have interest or doubts please send a message. Cheers !!! Hi all. We have a spare room or 2 available in our share house. Have a read below and if it tickles your fancy shoot us a msg and come over for a looksee. The Room: 1 medium room available, fully furnished and ready to go:) The room comes with the following: Double bed A desk with a chair Wardrobe Pillow and bed linen The House: Decent sized house with new-ish kitchen. Tiles throughout the house which seem to keep it cool in summer. Downstairs there is a carport and areas you can sort things if you have a bit of extra stuff. There is only 1 bathroom but the toilet is separate which is handy. There is a 2nd toilet is downstairs as well Nice green back yard perfect for chilling with a cheeky beer or 5 in. 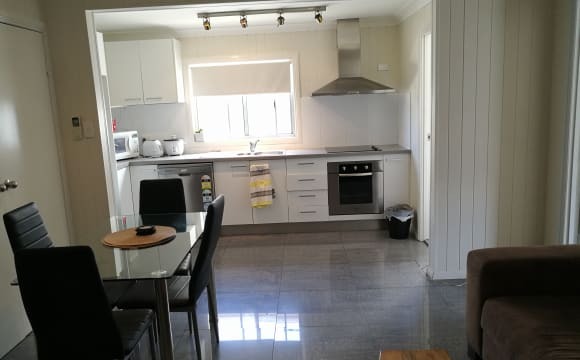 Lastly, the house is all furnished and has all the kitchen equipment washing machine, fridge space etc to make setting up after moving in easy. Parking: Not much parking space but if you have a car shoot us a msg and we can let you know the parking situation. Location: The house is located on 20 Latrobe St, East Brisbane – feel free to do some Googling to see if this location works for you. It is within walking distance to an IGA, and is 300m down the road from the cheapest/best sushi this side of town… I think anyways :p There are 4 bus stops with a 5 min walk of the front door as well. Rent, Bond and Bills: ALL BILLS INC IN RENT! This includes power, gas, water and unlimited internet. Bond is 4 x rent. If you can’t come up with the 4 weeks bond straight away I miiiiight be able to accept 2 weeks to start with however I will make that call once I meet you. Other things you should know ☺ No pets sorry No strict house rules… just the obvious stuff like clean up after yourself, be respectful to others and do your fair share of housework. We get a cleaner in around every month to give the house a good once over and as mentioned above we also get the lawns mowed which is all included in the rent. Who we are looking for… Keen on getting someone in who can pay rent on time (obviously) and knows how to clean up after themselves. Basically, just someone who is respectful and has their life together and drama free. Couples: Happy to accept couples. Please note rent will be $30 extra though. SHORT TERM RENTAL This is a lovely 2 bedroom 2 bathroom apartment, available for short stay 27th of April to the 8th of June. Dates and rent can be discussed but Ideal would be a minimum stay of 1 month. The room is furnished. You will live with a lovely and amazing female professional in her mid 30ties. Absolute fun and easy going. This is not a party household. Its a great place surrounded by parks and close to the city. Bus stop is in front of the house and Mowbray Park Ferry only a 5 min walk away. You will have your own bathroom and a big wardrobe, the room is also bigger than average. Off street parking for tenants behind the house. If this is right for you, or you have any further questions, feel free to send a message. Its also very convenient for anyone working in the city. Great friendly environment, huge house with nice outdoor areas. General areas are all welcoming and well maintained, this property is centrally located between UQ and QUT, both are 20 mins on public transport or 45 mins walking. Rooms have ceiling fans, own fridge, single beds, desks and TV. LEAFY COURTYARD APARTMENT NEXT TO KANGAROO POINT, 7 MINS TO CITY Fully-furnished retreat, so close to everything! No more commutes… AVAILABLE NOW, MESSAGE ME TO ORGANISE VIEWING  Let time pass you by as you enjoy your fully-furnished peaceful retreat just minutes from Brisbane city. This ground floor one bedroom apartment is sure to impress with its exclusive private courtyard and European laundry. Inclusions: - 1 off-street carpark in quiet 3 townhouse complex - Fully furnished - Crockery, cutlery, pots, pans, cups, glasses, cooking utensils - Separate bedroom with Queen size bed - Oodles of wardrobe space - Basic linen - Foldout double bed sofa - Claw foot bath with overhead shower - Large leafy courtyard with private access - Separate toilet - French-style claw foot bath - Television, stove, oven, washing machine, iron... Convenience is the key to the lifestyle offered here: - Mowbray Park Ferry terminal across the road, bus stop next door - Just 2.5km to Brisbane CBD as the crow flies - Walk to cafes, restaurants and supermarkets in minutes - Nearby attractions include Gabba, Southbank and West End - Enjoy jogging tracks, park, playground and BBQ areas - Direct access to Clem 7 * Unlimited high speed wifi and all other utilities included. 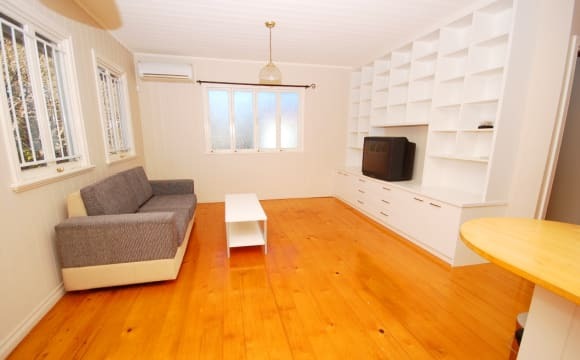 Rent $315/week…..Bond:$1,620 Message me to organise viewing. We will take care of your accommodation needs. The complex has a rooftop pool and BBQ area with a gym too, all with great views. Close to the city cat and bus routes, also walking distance to kangaroo point and south bank. There is also a free city hopper ferry about 15 min walk away and $8 Uber to city. We have NBN Internet provided at an extra cost. I have just bought all brand new furniture with washing machine and dryer too. You’ll have aircon and a fan in your room with full length mirrors with draws and shelves in wardrobe. The room will come with a queen size mattress and two bedside tables and a lamp that can be bought off the previous house mate or I can sell on if you already have your own stuff. A 2nd floor 3 bedroom apartment with a large kitchen, 1 bath and an on site washing machine - No Dryer. Fairly spacious living area, adsl2+ internet (unlimited), dish washer and balcony with a decent view across to Coorparoo. Hi Brisbane room seeker. We have 1xsingle room available from May 08. 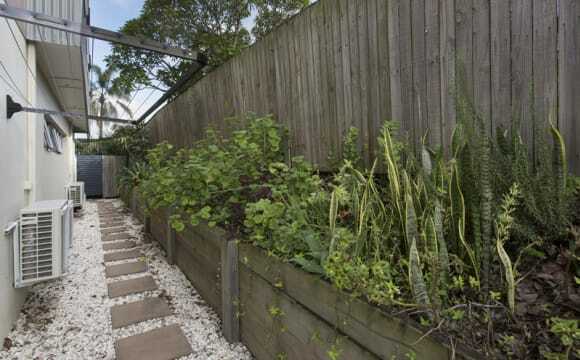 The room is in an easygoing accredited house share in East Brisbane. The house is set up for smart young professionals/mature students (all costs included). 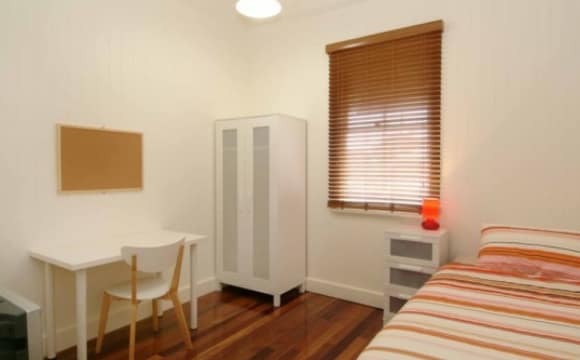 Would suit someone who wants a clean, comfortable, secure room close to CBD with flexible lease arrangements while they settle into their Brisbane lifestyle. 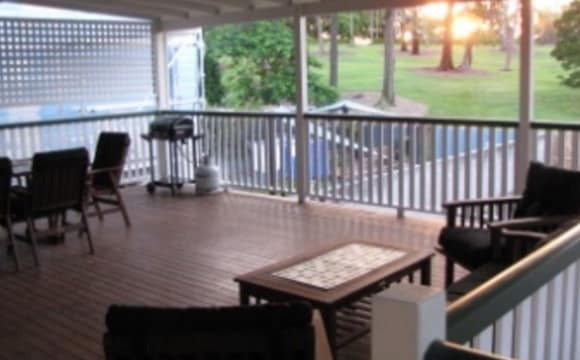 The house: Fully furnished house 2km from Brisbane City. The bedrooms are lockable with individual keyless security. Bed linen supplied, Broadband internet access included. Each room has use of own bar fridge and use of common fridge. Shared bathroom, kitchen and laundry facilities with house professionally cleaned weekly. Storage areas available for excess possessions. Undercover car accommodation off street. Garden is professionally maintained. The costs: Rent is $180 - $200per week. (depending on length of stay and size of room. The rent includes all utilities, elec, gas,water, internet, and weekly clean and restock of common use items. We charge a one off set up fee of $60 when moving in. Common use consumables included. Off street undercover parking. City views. Less than 10 min bus ride to Queen street Mall No Bond required - 2 weeks notice to vacate is all needed. Professional weekly clean. Linen supplied if required PIN code door. Split Air con installed $10 extra per week. Good luck with your Brisbane room search. Such a great location in a beautiful street. Easy walking distance to the river, great local cafes and coffee shoes. Very close drive in Woolies and Coles in Coorparoo. Beautiful old Queenslander with a big yard! Student or Intern Accommodation only, please no back packers or professionals. Hi, we are looking for 3 full time students or interns to join a mixed gender 5 bedroom share house in Kangaroo Point/East Brisbane. The house is about 25 minutes by bicycle to QUT Gardens Point using the Kangaroo Point cycle path and the Goodwill Bridge, or a 25 min walk to Riverside using the Story Bridge, the city cat ferry stop is about 350 meters away and provides a very convenient way to arrive at uni. Bus stops are also very close, less that 300 meters. You will be sharing with a total of four other house mates, currently there are only two people living in the house.Two fellows, one from Australia, the other from Japan, both are full time students at QUT. The available rooms: one is massive, 'the best room in the house' $225pw. 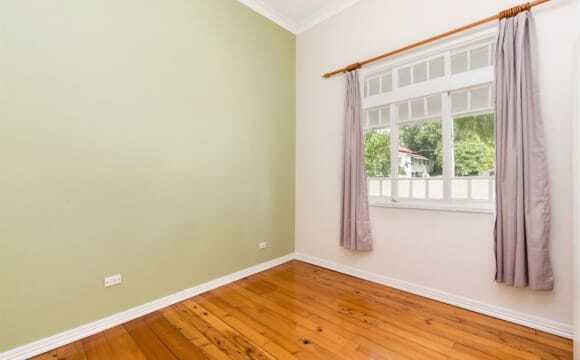 The other is a large bedroom with a double bed $205pw and the other is a bit smaller and has a single bed $185pw. All linen is provided and all have large wardrobes, a desk/chair and a floor and ceiling fan. The bond is $500.00 and the rent includes unlimited internet, all power and utilities. A large fridge /freezer, one shelf each, a front loading washing machine and a simple galley style kitchen takes care of the survival stuff. Amenities include table tennis, a BBQ and a large laundry with a front loading washing machine. Public Transport (bus and ferry), groceries shops, cafes and takeaways are all a very short stroll away with Mowbray Park at your back door. The house is very conveniently located, less than 1.5 kilometres from the city centre. About You: Only clean and tidy students or interns, no backpackers or workers please. We like to keep the place pretty tidy and expect you will too, everyone chips in on the cleaning duties. A bit of socialising is great and the back deck is perfect for it, but please no party animals, volume freaks or party till dawn people. If this sounds like it could work for you while studying or completing your intern ship please get in touch and we can set up a suitable time for you to drop around and view the house and meet the house mates. We live in a split level home and are fortunate to have the whole downstairs area to ourselves with private access, a garage and off street parking out the back also. The place comes fully furnished. We have made it very homely and it is a great place to come home to after a busy day. The lounge room has a nice cosy vibe to enjoy netflix &amp; stan. We also have a spacious outdoor area which is great for having people around but also means there is plenty of space to do your own thing. There is three bedrooms in total. Two will be available to choose from. They are pretty similar in size with built in cupboards, ceiling fans and can come furnished or not. Bathroom is shared and we have a spacious laundry area to use also. The best thing about this place is the amazing location. Very close to heaps of public transport options and only walking distance to various cafes, bars &amp; shops. The house is only 2KMs away from Southbank and super easy access to the motorway. The room you choose will be available from the 18th of May which is a nice amount of time to get to know the prospective roommate and ensure it is a good fit for the both of us :)))) **unfortunately no pets. 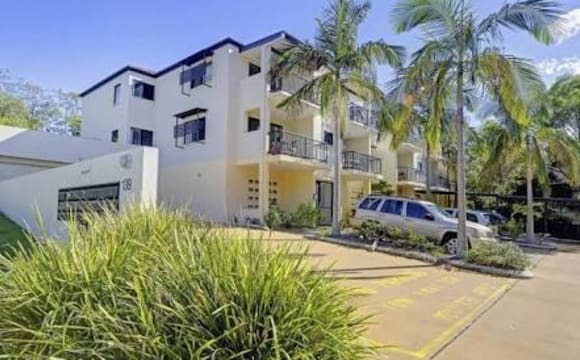 Centrally located in the inner city suburb of East Brisbane this safe and friendly neighbourhood offers everything right at your front door; The Gabba, public transport, cafes, restaurants &amp; bars. Catch a glimpse of the CBD from the rear deck! All bills are included, electricity, gas, water, wifi internet and cleaning of common areas. Rooms are all fully furnished with double or queen size beds. Spacious kitchen, refurbished bathrooms, big double bedrooms, ducted air con and highspeed internet.